The most powerful Nevadan ever? We have named roads and airports in his honor, but most Nevadans don’t know who Pat McCarran was. I have heard and read many stories about Pat McCarran over the years; I hope the stories you are about to read will give you an insight to who and what Pat McCarran was. Pat McCarran was born in Reno, the child of Irish immigrants. He grew-up on his Dad’s sheep ranch located 15 miles east of Reno. Growing up McCarran was involved in many fights. This behavior continued as a young man. Pat McCarran was one of the last of what Nevadan’s call, “saddle educated,” which meant he was a self made man who read and learned while working on his father’s sheep ranch. McCarran became an attorney, Nevada State legislator, District Attorney, a Nevada Chief Justice, Chairman of the Nevada State Board of Parole Commissioners, and served on the State board of Bar Examiners. After two unsuccessful bids in 1916 and 1926, McCarran was elected to the U.S. Senate in 1932, the first native Nevada born U.S. Senator. 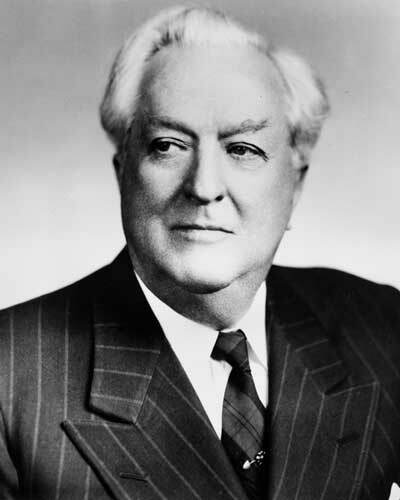 McCarran became well-known as one of the few Democrats who went against his own political party; and was totally against the New Deal policies of President Roosevelt. As a freshman Senator this normally would mean political suicide. But McCarran was considered a maverick, hard working, head strong and respected by both political parties. Although elected as a Democrat McCarran was in most part a conservative. He took a very strong anti-Communist stance and was a proponent of tighter restrictions on entry and admission to the United States to become a citizen. Isn’t it amazing that this issue is still at the forefront of American politics today? Pat McCarran was a “head strong know where he stood” kind of guy. He never forgot a favor. But he also never forgot those who stabbed him in the back, no matter how long it took, he always got even. He was also a man of generosity to the “down and out,” and a man of loyalty to a fault. This is reflected in McCarran’s staunch support of Senator Joseph McCarthy of Wisconsin. Pat McCarran came to be a powerful U.S. Senator. It was said he could introduce a bill calling for the execution of the President of the United States and get twenty votes to pass the bill. He became chairman of the Senate Judiciary Committee and was a ranking member of the Appropriations Committee. So in fact he had two powerful positions that controlled much of the legislation that went to or through Congress. Pat McCarran was known for dispensing thousands of favors to the so-called little people whom he understood so well. He had an administration policy that was never broken. If a Nevadan wrote a letter to him, the letter would be answered the same day and there were no exceptions. If action had to be taken on the letter in one way or another it was taken the next day. The action taken was not always favorable to the letter writer, but the Nevadan would always know where Pat McCarran stood within twenty-four hours. Even if you disliked him or disapproved the view he took, you had to respect that kind of guy. Don’t you wish we had politicians like him today? There are many Pat McCarran stories. Here are a few that I have heard or read over the years. When Pat McCarran was a U.S. Senator in Washington D.C. a young man came to visit McCarran in Washington. The young man came into McCarran’s office, and explained he was looking for a job in the Airline Industry and was hoping McCarran could give him some contact names in the industry. McCarran without hesitation picked up the phone and called Pan American Airlines and asked for the chairman of the board. The secretary told McCarran that the chairman was in a meeting. McCarran told her, “I don’t give a damn where he is, I want to talk to him and I want to talk to him now.” In less than a half an hour the chairman of the board called McCarran back. After a conversation with McCarran, the chairman offered the young man an interview with his personnel director at their New York office. McCarran replied, “No, you have your personnel director come to Washington, and he can do the interview right here in my office.” Lo and behold the personnel director did come to Washington, did the interview and the young man was hired by Pan American Airlines. When Pat McCarran was a young man he got drunk in a mining saloon. Not surprisingly Pat got into a brawl with some of the saloon patrons. The local Sheriff hauled him out of the saloon but instead of throwing Pat in jail, the Sheriff took the young McCarran to his home. The Sheriff’s wife cooked them both dinner and gave McCarran a place to “sleep it off” for the night. No one knows what was said to McCarran, but the Sheriff let him go without arresting him. Years passed and Pat McCarran became the Chairman of the Judiciary Committee which oversaw all of the U.S. Federal Judgeships. Lo and behold a Federal Judgeship became available in San Francisco. As it was customary, the local Bar Association would normally recommend one or two persons they felt could fill the job. It was also customary for the Chairman of the Judiciary Committee to rubber stamp their recommendation. But this was Pat McCarran. McCarran told the local Bar Association that he thought the son of a friend of his from Nevada, who was a Superior Court Judge in the area, should receive the position. With much protest the local Bar Association refused to approve the McCarran nomination. McCarran in a friendly statement told the local Bar Association that if that was the case there wouldn’t be any Federal Judges appointed in San Francisco, or for that matter any appointed in the United States. Pat McCarran being the Chairman of the Judiciary Committee was the sole person responsible for setting up meetings for the Committee. So, for three months McCarran didn’t set any Committee meetings. This started a backlog of needed Federal Judges all over the United States. The local Bar Association finally gave into McCarran and approved the son of his friend from Nevada for the judgeship in San Francisco. If you haven’t guessed by now, it was the son of the Sheriff that did the future U.S. Senator a favor many years ago, when McCarran was just a young lad. Greenspun openly supported Thomas Mechling a Democrat running against Alan Bible, who was supported by McCarran. As it turned out, Mechling won the Democratic primary, but lost in the open election against George Malone, a Republican running for re-election. McCarran had enough of Hank Greenspun and his newspaper. With one phone call to Las Vegas, every Las Vegas Casino owner with the exception of Benny Binion, pulled all their advertising from the Las Vegas Sun. McCarran’s plan was to break Greenspun forever. As it turned out Greenspun was able to produce evidence of the phone call, and the casino owners again began advertising in the Las Vegas Sun. The idea that a man could make one phone call, which led to all but one casino pulling out their ads, shows what a powerful and influential man Pat McCarran had become. Pat McCarran dropped dead of a heart attack while giving a speech in Hawthorne in 1954. His funeral was attended by thousands from the lowly buckaroo to the wealthy. His legacy is controversial, but the one thing that is undisputable, Pat McCarran was always on the side of Nevada. His support of Nevada mining, ranching and gaming helped shape the future of our great State. Pat McCarran is considered by many to be the most powerful politician in Nevada history but many believe as I do that Pat McCarran as a U.S. Senator, in his day, was the most powerful man in America.